Scientists have discovered in China the first complete skeleton of a pivotal ancestor of Earth's largest land animals  the sauropod dinosaurs. The new species, tentatively dubbed Yizhousaurus sunae, lived on the flood plains around Lufeng in the Yunnan Province of South China about 200 million years ago. The species helps explain how the iconic four-footed, long-necked sauropod dinosaurs evolved. Unlike the 120-foot-long, 100-ton sauropod giants that came later, Yizhousaurus was about 30 feet in length, but it shows all of the hallmarks of later sauropods: the beginning of a long neck, a robust skeleton and four-legged posture. 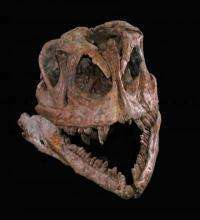 It also comes with an intact fossilized skull  which is very rare and crucial for understanding its place in the evolution of sauropods. "Sauropods have these big bones but their skulls are very lightly constructed and also very small," said paleontologist Sankar Chatterjee of Texas Tech University. Chatterjee presents the discovery on Sunday, Oct. 31 at the annual meeting of the Geological Society of America in Denver. Yizhousaurus's skull is broad, high and domed, less than a foot long with a short snout, eye sockets on the sides for scanning enemies. It has an unusually wide and U-shaped jaw, in top view, like that seen in later Camarasaurus, said Chatterjee. Numerous serrated and spoon-shaped teeth of the upper and lower jaws would shear and slide past each other for cutting plant material during feeding. The sturdy teeth and raised neck let the animal very easily nip small branches from treetops and then chew the plant material. "Once the plant food was ingested, a gastric mill in the stomach probably provided further mechanical breakdown of the plant," Chatterjee explained. Apparently the animal was well adapted to a life of eating plants to support its large body. Besides its telltale physical features, Yizhousaurus was also found in revealing company. A half century ago spectacular specimens of prosauropod dinosaurs such as Lufengosaurus were discovered at the same location. This makes sense, since most paleontologists are of the opinion that prosauropods gave rise to sauropods, despite the fact that the transition has been very vague, Chatterjee said. "This is why this new one (Yizhousaurus), may bridge this gap," he said.